Planning your weekend? Be sure to include some relaxing me-time in your itinerary. If you're in the Makati area, here's a new spa you can try. We often forget to make room for ourselves within our busy schedules. However, a little "me-time" keeps us sane and recharges our batteries for the stressful days to come. For many of us, a sufficient pick-me-up can be a spa trip for a few hours of peaceful, mindless bliss. Look forward to going on one this weekend. If you want to try something new, check out Toccare Spa at the brand-new fourth floor of Antel Spa Hotel Suites in Makati City. Tocarre Spa offers an exclusive, refreshing spa journey--a respite for your tired body and mind. They provide a diverse range of services, which include classic and contemporary hand, facial, and body massage; rejuvenating body wraps; all-new relaxation treatments; waxing; nail services; and even ear candling. Plus, they offer delectable spa cuisine, so you don't even need to leave the soothing confines of the spa to get a good meal. This treatment begins with a coco creme souffle body rub (a yummy-smelling, nourishing treat for the skin! ), followed by a rich milk bath in the treatment room's plush tub (think: Cleopatra!). The satisfactory finishing touch is Toccare's Signature Rose Quartz Massage, which utilizes the stone's relaxing, healing, and rejuvenating properties (it's also known to have the power to help you deal with matters of the heart!). This refreshing and relaxing treatment begins with a combination of lemongrass and sage body polish that will delight your senses. This is followed by Toccare’s Signature Crystal Massage, which uses the energizing, cleansing, and healing properties of Citrine, believed to promote positive energy and happiness. It's the perfect treatment for super stressed (or depressed) Cosmo chicks! With this package, Tocarre takes you on a unique spa journey. Based on your personal needs and preferences, the well-trained staff will actually design a package from their line of body massage, body wrap, hand and foot care, and face therapy. And to top it off, the Spa Cuisine, created by Granvia Cafe chefs, will be served at your beckoning. Talk about royal treatment! Tocarre customizes every spa experience, allowing you to select your own music, aromatherapy, and massage oils, among others. You'll really feel the love and care the moment you step into their warm, elegant lobby. Before you go into one of their thoughtfully decorated treatment rooms for the service of your choice, you can refresh yourself with a soothing shower and a quick trip to the steam room. 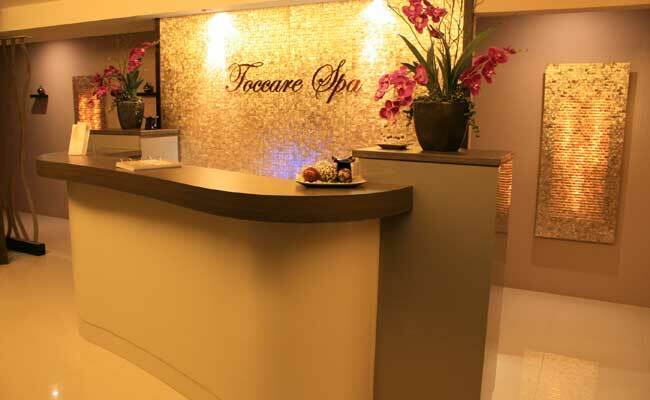 Toccare Spa is located at the 4th floor Antel Spa Suites, Antel Lifestyle City, 7829 Makati Avenue, Makati City. For inquiries or reservations, call (+632) 403-0808 or log on to www.antelspahotelsuites.com, www.avenuehotelsuites.com, or www.genesishotels.com.